he usual requirement for a diploma in a subject is that the holder be able to accomplish a result with the subject. Psychiatrists obtain their “diplomas” without ever demonstrating any cure of anything. Psychologists obtained “diplomas” in the mind for a subject which in all their textbooks insisted man could not be changed, that intelligence and personality could not be altered. In that the psychiatrist bragged that it took twelve years of training to be one and a psychologist boasted it took six years to be a psychologist, one can assume that they certainly took long enough to learn nothing. Other criminals require no diplomas to become competent murderers. It is in keeping with the rest of the fakery of psychiatry and psychology that this “training” also doesn’t take place. Both of these activities are sponsored by private groups who pretend to be officials of the state. The word “National” is a fake. The only expertise one can be sure of in psychiatry and psychology is fakery. They are without doubt the world’s most accomplished fakes. A diploma in a subject which can accomplish nothing is all part of the facade that is used to extort billions annually from the government. It would be far cheaper if governments just hired the Mafia to drug and kill their citizens and have done with it. 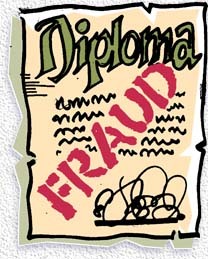 One is sure the Mafia could also furnish very good diplomas, earned most of them with many years in prison. Or, like those of psychiatry, outright counterfeits.